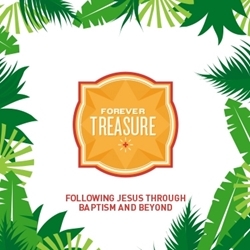 Forever Treasure is a simple way to help kids and parents learn what it means to follow Jesus through baptism and beyond. This 2 book set contains a kid's workbook and a parent/leader journal. Using the books together, the child and parent(s) will journey through the 4 steps - at home-at church-in the water and-beyond baptism. Children will discover a relationship with Jesus is a Forever Treasure.